Today, we did 4 daytime dives - Sand View, Koala, Kirby's Rock, and Cathedral - a nice combination of soft/hard coral reefs and sandy mucky bottom. There are so many nudis here that it is getting a bit ridiculous. Several times today, I passed over nudis that I had already photographed so I could make time for other things. "There's a nudi. Let me clear my mask. Oh, there's another nudi. Let me check my depth. Oh, there's another nudi." Ok, I exaggerate a little, but there are a LOT of nudis here. I used my new 105 mm macro lens for the first time today, on two dives. As expected, it was hard to autofocus in all except the brightest light. My focus light was borderline effective. 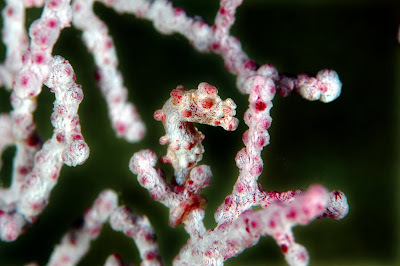 The autofocus tended to hunt a lot, especially with small and moving things, like pygmy seahorses. But, it was brilliant at capturing the real tiny stuff. I actually prefer the 105 mm to the 60 mm for shooting nudis. I took the 105 mm only after discussing with my guide what to expect on the dive. The funny thing is, when I switched back to the 60 mm lens, autofocus and composition suddenly felt like a breeze. The 105 mm is a fantastic lens but it has its limitations. I am doing 2 more dives tomorrow morning with the 105 mm lens... really looking forward to it. Highlights of today's dives were whip shrimp, pygmy seahorses, emperor shrimp, the biggest frogfish i have ever seen, and lots and lots of nudis. Thanks! In order: some crab, whip shrimp, pygmy seahorse, emperor shrimp, giant frogfish, some nudibranch.